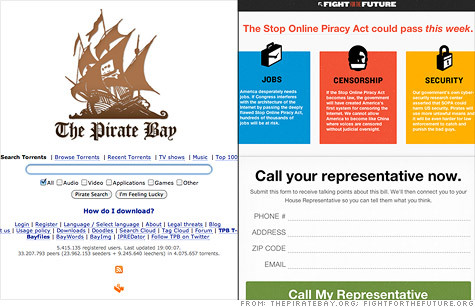 SOPA's backers say the sweeping anti-piracy bill is needed to squash sites like The Pirate Bay (left), but the tech industry says the bill is rife with unintended consequences. NEW YORK (CNNMoney) -- The tech industry is abuzz about SOPA and PIPA, a pair of anti-piracy bills. Here's why they're controversial, and how they would change the digital landscape if they became law. What is SOPA? SOPA is an acronym for the Stop Online Piracy Act. It's a proposed bill that aims to crack down on copyright infringement by restricting access to sites that host or facilitate the trading of pirated content. SOPA's main targets are "rogue" overseas sites like torrent hub The Pirate Bay, which are a trove for illegal downloads. Go to the The Pirate Bay, type in any current hit movie or TV show like "Glee," and you'll see links to download full seasons and recent episodes for free. Content creators have battled against piracy for years -- remember Napster? -- but it's hard for U.S. companies to take action against foreign sites. The Pirate Bay's servers are physically located in Sweden. So SOPA's goal is to cut off pirate sites' oxygen by requiring U.S. search engines, advertising networks and other providers to withhold their services. That means sites like Google wouldn't show flagged sites in their search results, and payment processors like eBay's (EBAY, Fortune 500) PayPal couldn't transmit funds to them. Both sides say they agree that protecting content is a worthy goal. But opponents say that the way SOPA is written effectively promotes censorship and is rife with the potential for unintended consequences. Silicon Valley woke up and took notice of the implications when SOPA was introduced in the House of Representatives in October. But its very similar counterpart, PIPA (the Protect IP Act), flew under the radar and was approved by a Senate committee in May. PIPA had been scheduled for a vote on January 24. But after a massive pushback from tech companies and their supporters, both SOPA and PIPA were officially "postponed" on January 20. Isn't copyright infringement already illegal? Yes. The 1998 Digital Millennium Copyright Act lays out enforcement measures. Let's say a YouTube user uploads a copyrighted song. Under the current law, that song's copyright holders could send a "takedown notice" to YouTube. YouTube is protected against liability as long as it removes the content within a reasonable timeframe. When it gets a DMCA warning, YouTube has to notify the user who uploaded the content. That user has the right to file a counter-motion demonstrating that the content doesn't infringe on any copyrights. If the two sides keep disagreeing, the issue can go to court. The problem with DMCA, critics say, is that it's useless against overseas sites. SOPA tackles that by moving up the chain. If you can't force overseas sites to take down copyrighted work, you can at least stop U.S. companies from providing their services to those sites. You can also make it harder for U.S. Internet users to find and access the sites. But SOPA goes further than DMCA and potentially puts site operators -- even those based in the U.S. -- on the hook for content that their users upload. The proposed bill's text says that a site could be deemed a SOPA scofflaw if it "facilitates" copyright infringement. That very broad language has tech companies spooked. Sites like YouTube, which publishes millions of user-uploaded videos each week, are worried that they would be forced to more closely police that content to avoid running afoul of the new rules. "YouTube would just go dark immediately," Google public policy director Bob Boorstin said at a conference last month. "It couldn't function." Tech companies also object to SOPA's "shoot first, ask questions later" approach. The bill requires every payment or advertising network operator to set up a process through which outside parties can notify the company that one of its customers is an "Internet site is dedicated to theft of U.S. property." Once a network gets a notification, it is required to cut off services to the target site within five days. Filing false notifications is a crime, but the process would put the burden of proof -- and the legal cost of fighting a false allegation -- on the accused. As the anti-SOPA trade group NetCoalition put it in their analysis of the bill: "The legislation systematically favors a copyright owner's intellectual property rights and strips the owners of accused websites of their rights." Who supports SOPA, and who's against it? The controversial pair of bills, SOPA and PIPA, have sparked an all-out war between Hollywood and Silicon Valley. In general, media companies have united in favor of them, while tech's big names are throwing their might into opposing them. SOPA's supporters -- which include CNNMoney parent company Time Warner (TWX, Fortune 500), plus groups such as the Motion Picture Association of America -- say that online piracy leads to U.S. job losses because it deprives content creators of income. The bill's supporters dismiss accusations of censorship, saying that the legislation is meant to revamp a broken system that doesn't adequately prevent criminal behavior. But SOPA's critics say the bill's backers don't understand the Internet's architecture, and therefore don't appreciate the implications of the legislation they're considering. In November, tech behemoths including Google (GOOG, Fortune 500) and Facebook lodged a formal complaint letter to lawmakers, saying: "We support the bills' stated goals. Unfortunately, the bills as drafted would expose law-abiding U.S. Internet and technology companies to new uncertain liabilities [and] mandates that would require monitoring of web sites." Where does the bill stand now? SOPA was once expected to sail quickly through committee approval in the House. But tech companies, who largely oppose the bills, mobilized their users to speak out. Wikipedia and Reddit launched site blackouts on January 18, while protesters hit the streets in New York, San Francisco, Seattle and Washington, D.C. Google (GOOG, Fortune 500) drew more than 7 million signatures for a petition that it linked on its highly trafficked homepage. The bills lost some of their Congressional backers as a result of the backlash. Both SOPA and PIPA were tabled on January 20. If the bills do come back up for discussion, they will likely be extensively reworked. One major tenet of the original SOPA legislation has already been removed. As originally written, SOPA would have required Internet service providers (ISPs) to block access to sites that law enforcement officials deemed pirate sites. But the White House said its analysis of the original legislation's technical provisions "suggests that they pose a real risk to cybersecurity," and that it wouldn't support legislation that mandates manipulating the Internet's technical architecture. The White House's statement came shortly after one of SOPA's lead sponsors, Texas Republican Lamar Smith, agreed to remove SOPA's domain-blocking provisions. 0:00 / 2:36 What is SOPA? What are the alternatives? One option, of course, is that Congress does nothing and leaves the current laws in place. Alternative legislation has also been proposed. A bipartisan group of lawmakers introduced the Online Protection and Enforcement of Digital Trade Act (OPEN) on January 18 -- the same day as the Wikipedia site blackout. Among other differences, OPEN offers more protection than SOPA would to sites accused of hosting pirated content. It also beefs up the enforcement process. It would allow digital rights holders to bring cases before the U.S. International Trade Commission (ITC), an independent agency that handles trademark infringement and other trade disputes. California Republican Darrell Issa introduced OPEN in the House, and Oregon Democrat Ron Wyden introduced the Senate version. OPEN's backers had posted the draft legislation online and invited the Web community to comment on and revise the proposal. SOPA supporters counter that the ITC doesn't have the resources for digital enforcement, and that giving it those resources would be too expensive. Smith, one of SOPA's lead sponsors, released a scathing statement about OPEN immediately after it was introduced. "The OPEN Act does not do enough to combat online piracy, and may make the problem worse," Smith wrote.